When I was still in Compostela Valley and received a text from Jeanne Torrefranca saying, "come to Cebu, let's do yoga everyday", I didn't think I'd be staying in Cebu a good 7 months. Many things happened, but the one overiding activity is definitely yoga. Not since I took my 200-hour Empath Yoga teacher training with Erica Boucher have I immersed myself in yoga. For some stretches of time, I was thinking, living, dreaming and waking up to yoga. Yoga became the black hole that sucked me deep into its inner bowels. It was a fix, an obsession and a passion. Through Jeanne's friendship, I smoothly transitioned into teaching yoga to many of Cebu's yoga studios, resorts and hotels. Jeanne was my benefactor who made things happen - introduced me to her community and friends, provided a roof over my head (and not accepting my rent money), taught me how to teach Ashtanga Yoga (I didn't finish it) and tagged me along her many gigs. We would be engaged in long, sometimes heated discussion about everything under the sun. Indeed, Cebu would be a radically different Cebu to me if not for Jeanne and her magic wand.I would affectionately refer to her as the Dragonfly Goddess (and us, as her Warriors of Light). Thank you Jeanne. I am always grateful. (Dec 6, 2013 - Mar 14, 2014) When I resumed his class again after more than a year of absence, it reaffirmed that I found the teacher whose teaching style and yogic philosophy I could subscribe to. I learned a lot from Veer. My practice grew exponentially. Every session was a level-up from the last. I was pushed beyond my comfort zone. I learned new approaches to yoga, it's history/mythology, I learned mudras and bandhas, meditation, pranayama and kumbhaka, etc. By the time I left, I had a vast overview of yoga, I could connect several difficult poses on arm-balances using bandhas, kumbhaka, etc. I learned how to enhance a pose given our human anatomy and more importantly, knowing what a pose is supposed to do. Even if I didn't stay long enough in Cebu until he would return back to India (~Aug 2014), I feel that I could more or less blueprint my path into the bigger yogic landscape he painted for us, my beloved YogiVeers (the same people who show up consistently to attend his classes). For everything I learned from him, I will always be profoundly grateful. Thank you, Veer! The handstand has been my burning passion in Cebu. This has been the most elusive of them all. For years now, I'd been trying to perfect my handstand. Even though my longest recorded handstand is 13 seconds, I was never into a steadystate. I would still be walking my hands all over the place. Nearly all my yoga injuries resulted out of my handstand practice. I have developed the strength to support my body weight on a handstand and I have developed the technique of throwing myself up for a vertical pose...but I can't achieve a steady state that would allow me to hold it long enough as a meditative mudra. I dipped my fingers on a few regular activities during my stay. They simply added dimension to my Cebu experience. 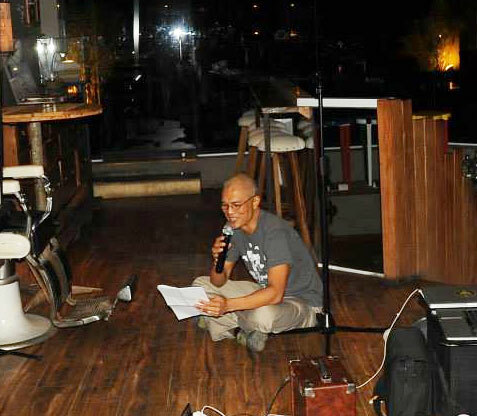 PechaKucha Nights - I just learned about this new presentation format that works - PechaKucha. This event happens at GILT every 2nd Tuesday of the month. I was even a presentor once and talked about my Burning Man experience. Even if it's not PechaKucha Night, GILT remains a great place to hangout with friends. Theosophical Society - they have a Saturday meeting where they expound on a topic relating to 'meaning of life', higher evolution and mindful existence. It's non sectarian and open to people of all pursuits and religion. They are attended to mostly by seekers coming from different types of persuasions. I met people there who became friends, some have become colleagues too. I was a regular until the last few meetings. Zen Meditation at Chu Un Temple - We would have a 30-minute meditation followed by a tea ritual. There would be small talk after. It's a good place to meet people cut from the same fabric. I used to be a regular. Couch Surfers - I attended one of their gatherings and met some interesting people outside my usual yogic circle. Apart from yoga, many things were reintroduced to me in Cebu. When the hotel deals dried up, I realized I had to find a more reliable way to put a roof over my head. Of course, I usually meet magnanimous people who offer their homes for me to stay at, but that's more of an unexpected surprise. It would be a cheat if I rely on that - or to even be accustomed to that. If land developers continuously renew their subscription to my website, then that tells me they are selling properties out of it. So, instead of having a fee-based web subcription from them, why not be an agent for them? For the same work, I stand to make more. I won't have to knock on developers' doors to sell them a webpage subscription (something I don't like doing), but instead, develop a realestate website on my own and sit back, relax, and let the powerful search engines do the selling for me - to a global audience. It's just a game of numbers anyway. The more properties I develop on the web, the increased likelihood I'll get inquiries. At least that's the plan. An unexpected Cebu surprise was attending Online Trading talks and test driving BMWs. In my renunciate paradigm, these are relics from my distant past - a failed attempt to own a Lamborghini through online swing trading. Sadly, I have neither the money nor the desire for either. But I think it's an affectionate curve-ball my benevolent universe throws at me as a practical joke. In my thought bubble, "nice try :)". Here in Cebu, Kaye Luym-Salas (otherwise known as the Director of Possibilities for A~List Events), keeps me in her short list of invitees to essential events here in Cebu (like online trading talks, fashion shows, art openings, etc.) - thank you, Kaye. Leaving Cebu came to me as an unexpected curve-ball. I thought I would settle here. My yoga practice with Veer was going strong. I was thriving. I found yoga practitioners within the community I could resonate with, I was beginning to expand my social horizon as I continued to meet new and interesting people, I shifted business direction requiring a more stable residency...I had "Cebu" practically tattoed to my forehead. I had an open invite for a beachfront resort in Boracay but I chose to remain in Cebu. An invite to pursue advanced scuba diving in Apo Island with hotel stays in Dumaguete but again, I chose to remain in Cebu. But in the rare episode of energy discord (yes, I am trying my best to be vague here), a new path was once again blazed for me. It was a choice - stay in Cebu and continue what I've started, or choose the uncertainty life is putting on my plate. It was another case of Red Pill vs. the Blue Pill. As a seeker, I had to choose the red pill and allow life to take me where it takes me. But given how life has been unraveling for me as I follow its bidding in full compliance, I take faith that there is something else in store for me outside Cebu. For all the abundance, the generosity, the warmth and the bliss...daghang salamat, Cebu and to all the wonderful people who call it home. »» next Lucid Thought story: A Cure for Cancer?